Solar power installations have been on the rise in California since 2006, and all of that energy is making a dent in the state's power grid. Now, the state utility companies are going to start putting in huge batteries to store excess power that is produced by its customers. This is yet another step in the fight to make sure that the California power grid does not experience an catastrophic failure in the future. The batteries that the utilities will use are going to be the size of 18-wheelers and will discharge power at night when there is no solar energy to use. 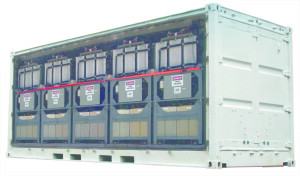 This backup power system will allow customers to have energy all of the power they need regardless of the conditions around them. As a backup to traditional energy sources, these batteries can help to keep California power customers' lights on all throughout the year. Posted in Electricity Storage, Solar Energy. Tags: batteries, energy storage, excess power, power company, solar energy on January 22, 2014 by Kenny.